We aim to cover all the basic skills needed to help you on the road to making top quality furnishings for your own home. 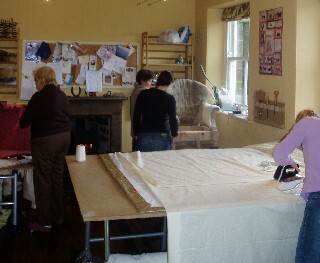 Students often attend this course when they are considering earning a living making furnishings too. These skills include assessing the most suitable window dressing, measuring up, calculating fabric quantities, pattern matching and pattern placement, choosing the right fabric, managing a sewing machine and hand sewing. 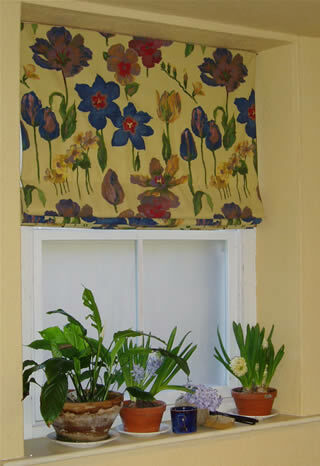 In the course of the weekend you will make a small lined curtain, a lined (or interlined) Roman blind and one or two cushions if there is sufficient time. Ideally we would like you to work on specific projects for you own home but they cannot be large. Materials: We stock all the materials you will require (except the main fabric), these will be charged for at the end of the course. Do ring if you would like Angie to calculate fabric quantities for you or discuss any other issues. There will be a maximum of 3 students on this course.